2104a, Used Rims, 16x7, 5 LUG 5-1/2", 98-99, DODGE, 1500, POLISHED, 3 SPOKE, ALLOY. 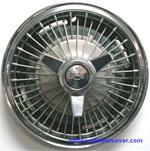 3011a, HUBCAP USED, 14", 65-67,CHEVY, CHEVY II, PASSENGER, IMPALA SS, NOVA SS, SS LOGO, 3 SPOKE CENTER, RIBS, 12 POCKETS. 3087b, Used Rims, Ford, 15x7, 5 LUG, 4-1/2, 94-95, FORD, Mustang, SPARKLE SILVER, 3 SPOKE, 3 SLOTS IN EACH SPOKE, 24 mm OFFSET, WITHOUT EXPOSED LUG NUTS, WITHOUT CENTER CAP NOTCH. 3172b, Used Rims,15x7, 5 LUG, 4-1/2", 97 -98, Mustang, MACHINED FINISH,DARK ARGENT POCKETS, 3 SPOKE WITH 3 OPENINGS, ALUM. 3959, Hubcap used, 13", 64-66, CHEVY, 11, CORVAIR, WIRE TYPE, 3 SPOKE EMBLEM, ETCHED OUTLINED BOWTIE , METAL CLIPS. 3959, Hubcap used, 13", 64-66, CHEVY, 11, CORVAIR, WIRE TYPE, 3 SPOKE EMBLEM WITH ETCHED OUT LINED BOWTIE , METAL CLIPS. 4012, Hubcap used, 15", 69, OLDS, OLDSMOBILE, CUSTOM CRUISER, 88, 98, JET STAR, REGENCY, PASSENGER, 3 SPOKE TYPE, POLISHED OUTER RING, 3 BLACK PAINTED POCKETS, 2 THIN BLACK PAINTED LINES, WORDS OLDSMOBILE, ETCHED LOGO, METAL CLIPS. 5021, Hubcap used, 15", 69-70, PONTIAC, PASSENGER, RIB TYPE, POLISHED OUTER RING, THREE SPOKE, RIBBED CENTER, THIN RED RING, RED PMD LOGO, SPRING CLIPS. 55532, Hubcap used, 14", 96-98, HYUNDAI, ELANTRA, SILVER, 3 SPOKE, RAISED LOGO, 4 HOLE, HELD ON BY LUG NUTS. 59512b, HUBCAP USED,14", 88-89, RENAULT, MEDALLION, PAINTED SILVER, 3 SPOKE, 3 SETS OF 5 SQ & 2 TRIANGLES, NO LOGO, PLASTIC CLIPS & WIRE RING. 60172a, USED RIM, 15X5-1/2, 5 LUG, 5-1/2", 97-98, CHEVY, SUNRUNNER, TRACKER, ALUM, 3 SPOKE, MACHINED, GRAY METALLIC. B=SILVER METALLIC. 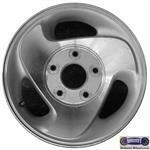 60172b, USED RIM, 15X5-1/2, 5 LUG, 5-1/2", 97-98, CHEVY, SUNRUNNER, TRACKER, ALUM, 3 SPOKE, MACHINED, SILVER METALLIC. 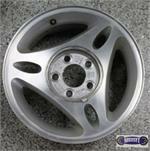 60172b, USED RIM, 15X5-1/2, 5 LUG, 5-1/2", 97-98, CHEVY, SUNRUNNER, TRACKER, ALUM, 3 SPOKE, MACHINED, SILVER METALLIC. A=GRAY METALLIC. B=SILVER METALLIC. 62147c, CENTER CAP USED, 93-97, NISSAN, PATHFINDER, P/U, OPEN CAP, SILVER PAINTED, THREE RAISED EDGES MATCH SPOKES, 11" DIA.